Southwest Odyssey Tours Photo-Geographic Adventures explore some of the most historically significant and majestic locations - oftentimes off the beaten path - where you can capture the true essence of each destination. Expert-level, professional photographers provide hands-on instruction, location-specific tips and tricks, and advanced techniques so you can capture stunning images to accent your personal and professional portfolios. Whether you prefer traditional film photography or digital photography, these fun, educational adventures allow you to get the most out of your equipment, while learning the history, culture, and ambiance of each location. 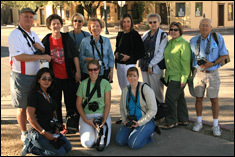 Southwest Odyssey Tours Photo-Geographic Adventures are open to all experience levels. In addition to on-location instruction, each Photo-Geographic Adventure discusses personal safety while shooting, camera and lens settings, photo composition, histogram reading, and exposure bracketing. Custom and private workshops are also available. Select your Photo-Geographic Adventure now by clicking on a city and state below. 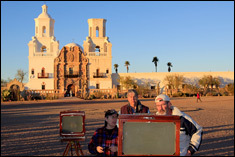 Explore the heritage and heart of Tucson where the architecture, sights, and people make perfect subjects for a variety of photographic styles and techniques. Designed for photographers of all skill levels, after capturing your own personal masterpiece, explore modern trends at a nearby museum. Discover new ways to capture the present and the past! 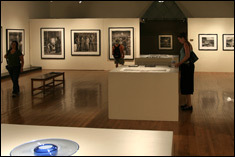 This Photo-Geographic Adventure explores the movement and ambiance of present day city life and then focuses on Tucson's fascinating past. 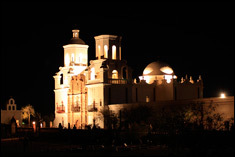 "The White Dove of the Desert," San Javier Del Bac Mission, is arguably one of the most beautiful sites to photograph in the Southwest. It's massive shapes and shadows provide a challenge for even the most experienced photographer. Our expert will show you how to capture its stunning beauty! Think Tucson is beautiful during the day? Wait until you photograph it at night! We will teach you how to capture the colors and shimmering lights of the city using a variety of special techniques. 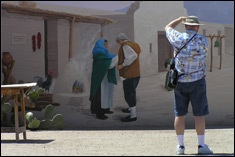 Embrace the beauty and culture of Tucson during this full day Photo-Geographic adventure. Our professional instructor will guide you on how to get the most from your camera and find unique photo opportunities most visitors would never discover. Also, you'll be given special access to University of Arizona's Center for Creative Photography before creating a sunset masterpiece. Perfect for photographers of all levels. © 1994 - 2019 Southwest Odyssey. All rights reserved.